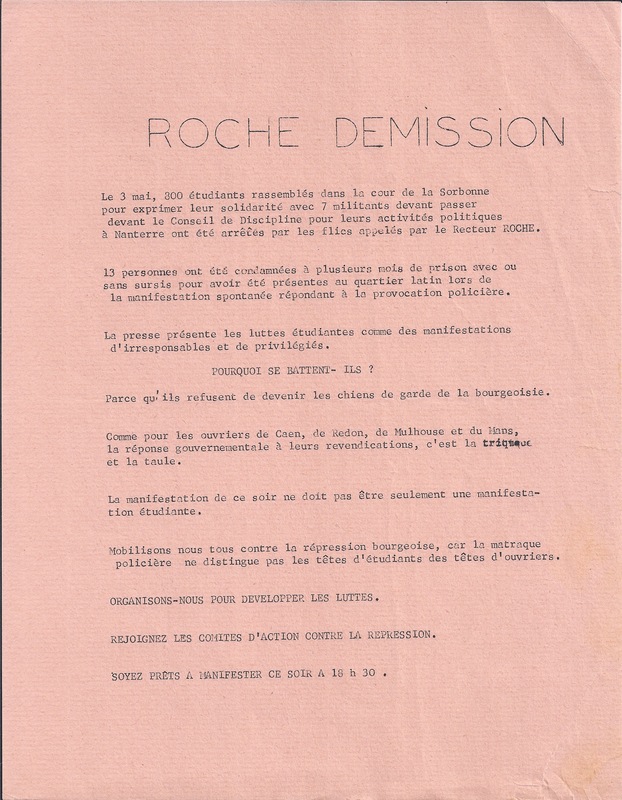 On May 3, 300 students assembled in the courtyard of the Sorbonne to show their solidarity with the 7 militants going before the Disciplinary Council because of their political activity at Nanterre, who had been arrested by the cops called in by the Rector ROCHE. 13 people were sentenced (with some sentences suspended) to a number of months in prison for having been present in the Latin Quarter during the spontaneous protest responding to police provocation. The press represented the students’ fight as a protest of the irresponsible and the privileged. Because they refuse to become the guard dogs of the bourgeoisie. Just as for the workers of Caen, Redon, Mulhouse and Le Mans, the government’s response is the baton and prison. Tonight’s demonstration mustn’t only be a student protest. Let’s all mobilise against bourgeoisie repression, because the police truncheon doesn’t distinguish between the heads of students or workers. LET’S ORGANISE OURSELVES TO EXTEND THE STRUGGLE. JOIN THE ACTION COMMITTEES AGAINST THE REPRESSION. BE READY TO DEMONSTRATE TONIGHT AT 6:30pm.